Do it the Bard Way! GreenStage’s theatre camps take each student on a personal journey through the world of Shakespeare. Their natural imaginations will be embraced and nurtured as their ability to focus and work as a team increases. Each week-long camp ends with a free performance (picnic recommended) in the parks for family and friends. All camps directed by GreenStage Staff. Costumes are provided. Campers should bring a lunch and drink daily. 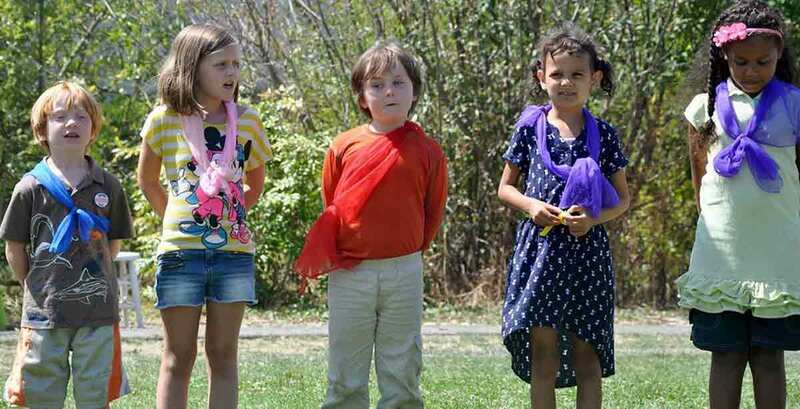 In our Pee Wee camps, creative dramatics, games, and art bring your child into the imagination of Shakespeare’s world. They will explore several short pieces of his plays and learn about getting into character, figure out how to tell a story as part of a group, learn a few phrases in the original language, and discover the joys of performing.. When Viola is separated from her twin brother in a shipwreck, she finds herself stranded in Illyria. Disguised as a man, she gets a job (and falls in love) with Duke Orsino, who is in love with Olivia, who falls in love with the disguised Viola! Students will memorize and perform a cutting of this play. Besides working on acting, students will play games while learning to speak and understand Shakespeare’s language. Using the tragic story of Macbeth as a starting point, students will create their own play by twisting the famous tragedy into a comedy–a kind of “Fakespeare”! Students will create this parody together using improv and playwriting techniques to shape their own version of these events. A few basic stage combat moves may be taught and used in our play also. It’s up to the students to create a fun version of one of Shakespeare’s most bloodthirsty tales. Shakespeare’s famous tragedy depicting Macbeth’s murderous climb to the throne contains witches, ghosts, swordfights, and murder most foul! The week will be spent learning the story and demystifying the original language while memorizing and rehearsing a cutting of the play. We will also train in some stage combat, including basic swordplay; play some games; and possibly fashion some set pieces. Camps at Queen Anne Community Center and Magnuson Park Community Center are registered through Seattle Parks and Recreation. Register online at the Seattle Parks Department website, OR you can register by calling the Community Centers at the numbers below. 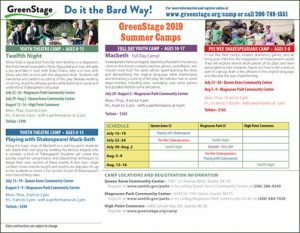 GreenStage’s educational programs support the values of successful learning and include summer shows for ages 5-18. Our theatre camps take each student on a personal journey through the world of Shakespeare. Their natural imaginations will be embraced and nurtured as their ability to focus and work as a team increases. All offerings focus on positive reinforcement and esteem building skills as our young artists explore Shakespeare’s mind-expanding concepts and beautiful world vision. Our instructors create supportive environments in the beauty of the Seattle area parks where we have been staging our professional shows for 28 years. Each week-long camp ends with a free performance (picnic recommended) in the parks for family and friends. Registrations are taken on a first come, first served basis. REFUNDS of camp fees are only possible up to two weeks prior to the start of camp. We will refund all payments if your registration cannot be processed due to full camps, or cancelled camps, etc. Camp Cancellations: If enrollment is insufficient we reserve the right to cancel camps. In this case all tuition paid would be returned in full.